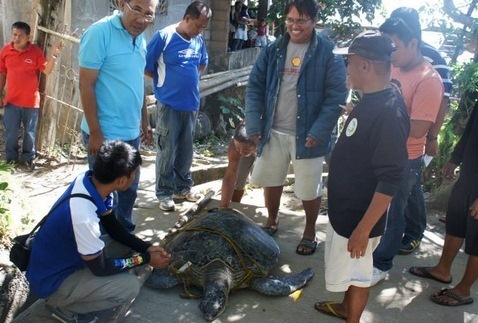 Morning of June 3, 2013, the office of the Municipal Mayor received news that a dead giant green sea turtle has been found and brought to the vicinity of the Municipality Hall. The turtle was said to be found by a group of fishermen from the island barangay of Sag and that they found it floating in the area of the Danajon Double Barrier Reef in the seawaters of Talibon, Bohol. The fishermen were led by a Mr. Delio Bejasa, 44, and accompanied by Samuel Arcayos,41, Merlo Sapagio,19, Leonisio Saplagio Jr,31, all from Barangay Sag. The group hailed the boat carrying the Talibon fishwardens, with Mr. Villamil (Officer-In-Charge of the Coastal Resource Management Office of the Municipality of Talibon) on board. The fishwardens were patrolling the area at that time. According to Mr. Delio, their group found the turtle and decided to load it on their vessel and then called the attention of the patrolling team because they were at a loss on what to do with it and they were afraid of being accused of poaching since the turtle was an endangered marine mammal. For proper protocol, Mr. Villamil took custody of the dead turtle and of the fishermen for further investigation. They were brought to the Talibon Fishwarden Headquarters were the fishermen’s names were recorded and the turtle weighed. The turtle weighed 112 kilograms and is 38 inches in length, 35 inches in width and 21 inches in height. 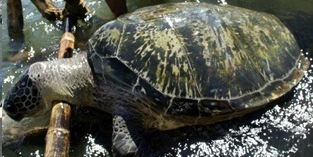 It was identified as a green sea turtle. The Department of Environment and Natural Resources – Community Environment Natural Resources Office (DENR-CENRO) was informed of the incident and was asked on matters pertaining to what legal actions and reports to be taken re this endangered species. Mr. Jesus D. Lagura, Coastal and Marine Management Section (CMMS) Coordinator was sent by DENR and helped in assessing the cause of death of the turtle. The turtle was found to have no external wounds such as may be caused by stabbing and suffered no bruises on any part of its body that may be caused by net entanglement. Mr. Laruga suspects that the turtle’s death may have been caused by poisoning brought about by dynamite or blast fishing but they could not verify this because they cannot perform a deeper post-mortem investigation by dissecting as they do not know of anyone who is an expert on this. Besides, the turtle was already on the early stage of decomposition.